This summer you’ll be everyone’s favorite person with your challenge coin bottle opener. These bottle openers can be manufactured with any design or color scheme you like. They can be great give-aways at retirement parties, bachelor events, or just about any celebration you can think of. Add an extra touch to your order with numbering or edge engraving for even more personalization. Guaranteed to work: While similar coins are just for “show” – these coins are 100% able to open a bottle of beer when our guidelines are followed*. We use the right specs in the design process to make sure they are functional, every time. We can even add a second cutout in your coin bottle opener so that it can be worn on a necklace or key chain for easy access! Considering the history of challenge coins, it’s surprising that it has taken this long for the challenge coin bottle opener to arrive. Drinking and challenge coins have been popular with soldiers since World War I. Part of the fun of challenge coins is “challenging” fellow soldiers to show their coins at local bars. If a soldier does produce the coin, they have to buy a round of drinks. Now any challenge coin collector who enjoys a cold brew on a summer afternoon can pop the top off their favorite beer with a challenge coin bottle opener. 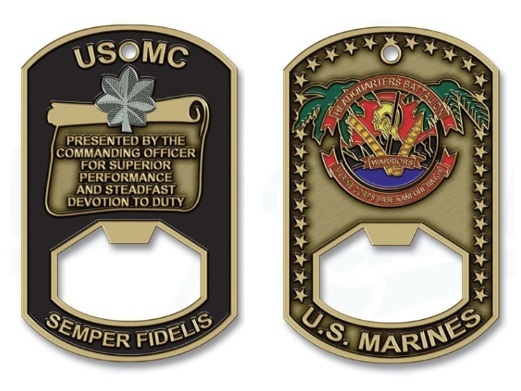 Becoming very popular as commemorative or memorabilia giveaway coins, the new take on the coin is a pop-top challenge coin bottle opener. It comes in various shapes and sizes. The stronger metals are the best choice for the bottle opener. They will be able to be functional and relatively indestructible. 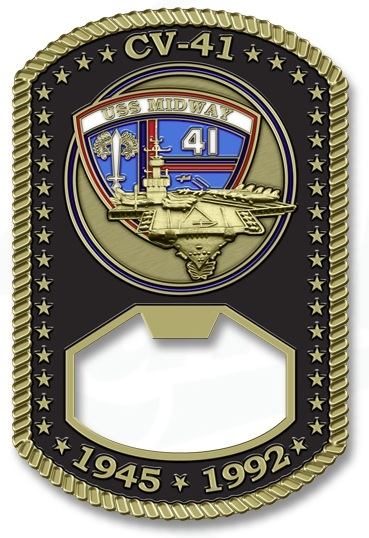 The front and back lettering and insignia or logo can be raised, painted and have an epoxy dome finish or can simply be brushed, polished or antiqued. Its finish can be smooth or rough. The rim is smooth and even around and flush to the front and back. The edge of round shapes can be diamond cut, roped, or even flowered. There are many, many characteristics that can be applied to make this coin your very own. 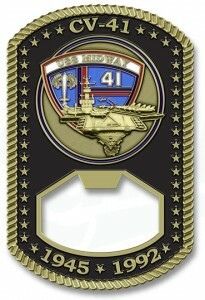 Challenge coin bottle openers are used at home, in bars and other social gatherings. These coins are a spectacular hit and conversation piece at any barbecue or pool party. What an asset it would be to have one of these bottle openers on hunting or fishing camping trips. They are given at conventions, parties, ceremonies, assemblies, dedications or any other event you might want to commemorate. The recipients are usually being honored or awarded for something they have done or participated in. They promote camaraderie and loyalty. Admirals, chiefs, and presidents have given these coins. They are long lasting and forever a reminder of the event and spirit in which it was given. 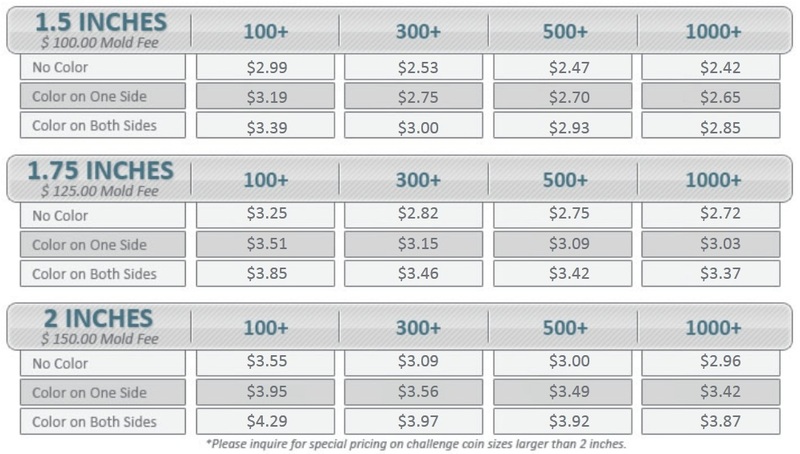 A pricing chart and a toll-free phone number is available below, so you can call if you want to customize your coin or speak with a representative that can help you with the information you are looking for but can’t find. We look forward to helping your unit or group come up with a lasting bottle opener bearing your trademark or emblem – just give us a call to being the process. We offer free design services so you can see what your coin will look like before you spend a dime. It’s just part of what makes the Challenge Coins Limited experience superior to the competition.